movement, it also can be worrisome. Sometimes a person with sleep apnea can stop breathing altogether, which can spark panic for spouses and partners. Luckily, there are plenty of sleep apnea treatments available. In our last blog, we discussed the treatment options for weight loss and a sleep apnea mouthpiece. However, there are other options available, such as surgical options and positional therapy. Due to these after-effects of a possible surgery, most people revert to using non-invasive techniques. However, if you do nothing about your sleep apnea, you could be doing lasting damage to your body. Worse, the people around you could become irritated by their own lack of sleep. Positional therapy is a type of sleep apnea treatment that uses the position in which you sleep to help with your symptoms. The idea to this behavioral strategy is that sleeping on your back incites sleep apnea and its symptoms. If you train yourself to sleep with proper posture, you will significantly aid the severity of your sleep apnea symptoms. Sleeping on your back is called the “supine” position, and it is one of the reasons why your air pathways can be cut off. Positional therapy involves that you wear a special device when you rest, specifically around your waist or back. The apparatus forces you to sleep on your side and makes it difficult for your body to naturally roll on your back. In 2012, a study found that positional therapy was an effective sleep apnea treatment. If your sleep apnea symptoms are uncontrollable and are taking a toll on your beauty rest or your partners, it is time to seek help. Andrew S. Curry D.D.S can give you a mouthpiece that can help with your symptoms. 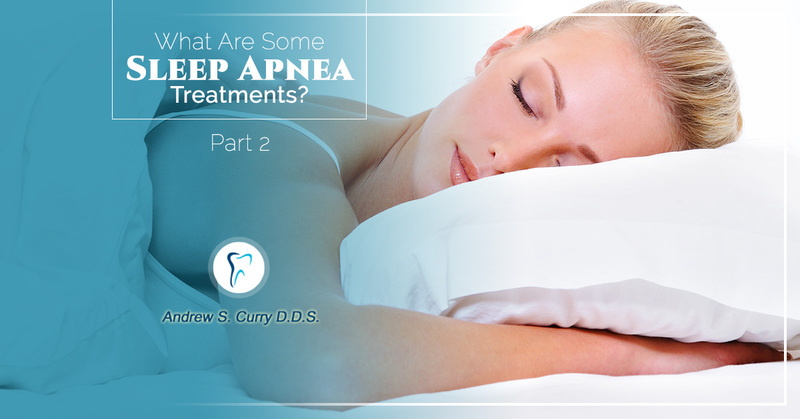 Our practice is prepared to help you and give you a non-invasive method to help your sleep apnea symptoms. Contact us today!